"RIT" redirects here. For other uses, see RIT (disambiguation). Rochester Institute of Technology (RIT) is a private doctoral university within the town of Henrietta in the Rochester, New York metropolitan area. RIT is composed of nine academic colleges, including the National Technical Institute for the Deaf. The Institute is one of a few engineering institutes in the State of New York, including New York Institute of Technology, SUNY Polytechnic Institute, and Rensselaer Polytechnic Institute. It is most widely known for its fine arts, computing, engineering, and imaging science programs; several fine arts programs routinely rank in the top 10 nationally according to US News & World Report. The university began as a result of an 1891 merger between Rochester Athenæum, a literary society founded in 1829 by Colonel Nathaniel Rochester and associates, and The Mechanics Institute, a Rochester institute of practical technical training for local residents founded in 1885 by a consortium of local businessmen including Captain Henry Lomb, co-founder of Bausch & Lomb. The name of the merged institution at the time was called Rochester Athenæum and Mechanics Institute (RAMI), despite of the fact The Mechanics Institute was considered as the surviving school by taken over The Rochester Athenaeum's charter and celebrating its founding year of 1885. In 1944, the school changed its name to Rochester Institute of Technology, re-established it's founding charter of 1829 and became a full-fledged research university. The Institute originally resided within the city of Rochester, New York, proper, on a block bounded by the Erie Canal, South Plymouth Avenue, Spring Street, and South Washington Street (approximately 43°09′09″N 77°36′55″W﻿ / ﻿43.152632°N 77.615157°W﻿ / 43.152632; -77.615157). Its art department was originally located in the Bevier Memorial Building. By the middle of the twentieth century, RIT began to outgrow its facilities, and surrounding land was scarce and expensive; additionally, in 1959, the New York Department of Public Works announced a new freeway, the Inner Loop, was to be built through the city along a path that bisected the Institute's campus and required demolition of key Institute buildings. In 1961, an unanticipated donation of $3.27 million ($27,416,292 today) from local Grace Watson, for whom RIT's dining hall was later named, allowed the Institute to purchase land for a new 1,300-acre (5.3 km2) campus several miles south along the east bank of the Genesee River in suburban Henrietta. Upon completion in 1968, the Institute moved to the new suburban campus, where it resides today. In 1966, RIT was selected by the Federal government to be the site of the newly founded National Technical Institute for the Deaf (NTID). NTID admitted its first students in 1968, concurrent with RIT's transition to the Henrietta campus. In 1979, RIT took over Eisenhower College, a liberal arts college located in Seneca Falls, New York. Despite making a 5-year commitment to keep Eisenhower open, RIT announced in July 1982 that the college would close immediately. One final year of operation by Eisenhower's academic program took place in the 1982–83 school year on the Henrietta campus. The final Eisenhower graduation took place in May 1983 back in Seneca Falls. In 1990, RIT started its first Ph.D. program, in Imaging Science – the first Ph.D. program of its kind in the U.S. RIT subsequently established Ph.D programs in six other fields: Astrophysical Sciences and Technology, Computing and Information Sciences, Color Science, Microsystems Engineering, Sustainability, and Engineering. In 1996, RIT became the first college in the U.S to offer a Software Engineering degree at the undergraduate level. The RIT campus as seen from the air, looking south, Genesee River on the right (2007). The current campus is housed on a 1,300 acres (5.3 km2) property. This property is largely covered with woodland and fresh-water swamp making it a very diverse wetland which is home to a number of somewhat rare plant species. The campus comprises 237 buildings and 5.1 million square feet (474,000 m²) of building space. The nearly universal use of bricks in the campus's construction — estimated at 14,673,565 bricks in late 2006 — prompted students to give it the semi-affectionate nickname "Brick City," reflected in the name of events such as the annual "Brick City Homecoming." Though the buildings erected in the first few decades of the campus's existence reflected the architectural style known as brutalism, the warm color of the bricks softened the impact somewhat. More recent additions to the campus have diversified the architecture while still incorporating the traditional brick colors. In October 2013, Travel+Leisure named it as one of the ugliest college campuses in the United States, citing the monotone brick and the suburbanization, leaving almost no youth activities within walking distance of the campus. In 2009, the campus was named a "Campus Sustainability Leader" by the Sustainable Endowments Institute. The residence halls and the academic side of campus are connected with a walkway called the "Quarter Mile." Along the Quarter Mile, between the academic and residence hall side are various administration and support buildings. On the academic side of the walkway is a courtyard, known as the Infinity Quad due to a striking polished stainless steel sculpture (by Jose' de Rivera, 1968, 19'×8'×2​1⁄2') of a continuous ribbon-like Möbius strip (commonly referred to as the infinity loop because if the sun hits the strip at a certain angle it will cast a shadow in the shape of an infinity symbol on the ground) in the middle of it; on the residence hall side is a sundial and a clock. These symbols represent time to infinity. [dubious – discuss] The Quarter Mile is actually 0.41 miles (0.66 km) long when measured between the mobius sculpture and the sundial. The name comes from a student fundraiser, where quarters were lined up from the sundial to the Infinity Sculpture. Standing near the Administration Building and the Student Alumni Union is The Sentinel, a steel structure created by the acclaimed metal sculptor, Albert Paley. Reaching 70 feet (21 m) high and weighing 110 tons, the sculpture is the largest on any American university campus. There are six RIT-owned apartment complexes: Colony Manor, Global Village, Perkins Green, Racquet Club, Riverknoll and University Commons. Along the Quarter Mile is the Gordon Field House, a 160,000-square-foot (15,000 m2), two-story athletic center. Opened in 2004 and named in honor of Lucius "Bob" Gordon and his wife Marie, the Field House hosts numerous campus and community activities, including concerts, career fairs, athletic competitions, graduations, and other functions. Other facilities between the residence halls and academic buildings include the Hale-Andrews Student Life Center, Student Alumni Union, Ingle Auditorium, Clark Gymnasium, Frank Ritter Memorial Ice Arena, and the Schmitt Interfaith Center. The Red Barn at the west end of the campus is the site of RIT's Interactive Adventures program. Park Point at RIT (originally referred to as "College Town") is an 80,000-square-foot (7,400 m2) multi-use residential and commercial enterprise on the northeast corner of the campus. Park Point is accessible to the rest of the RIT campus through a regular bus service loop, numerous pedestrian paths connecting Park Point to the RIT Main Loop, and main roads. Although originally intended as added student housing, financial penalties resulting from developing on swampland led RIT to lease Park Point to Wilmorite for a period of twenty years and subsequently develop the property without the institute incurring additional fees. A view of the campus heading from the College of Business to the Academic buildings. Backside view of the James E. Booth Hall, home to the College of Imaging Arts and Sciences. A look at a fountain on campus. Thomas Gosnell Hall sits in the background, home to the university's science center. The RIT Art Collection, part of the RIT Archive Collections at RIT Libraries, comprises thousands of works, including hundreds by RIT faculty, students, and alumni. The collection grows every year through the Purchase Prize Program, which enables the Institute to purchase select art works from students in the School of Art and Design, the School for American Crafts, and the School of Photographic Arts and Sciences. Sentinel – a 73-foot tall sculpture created by the acclaimed metal sculptor, Albert Paley, located on Administration Circle. Growth and Youth – a set of two murals by Josef Albers located in the lobby of the George Eastman Building. Principia – a mural by Larry Kirkland that is etched into the black granite floor of the atrium in the College of Science (Gosnell Hall). The work features illustrations, symbols, formulae, quotes, and images representing milestones in the history of science. Three Piece Reclining Figure No. 1 – a bronze sculpture by English artist Henry Moore located in Eastman Kodak Quad. Grand Hieroglyph – a 24-foot long tapestry by Shiela Hicks located in the George Eastman Building. Sundial – a sculpture by Alistair Bevington located on the Residence Quad. The Monument to Ephemeral Facts – a mixed media sculpture by Douglas Holleley located in Wallace Library. Unity - a 24-foot tall stainless steel sculpture sited between the College of Art and Design, the College of Engineering Technology, and the College of Engineering. As of 2017, the president is David C. Munson Jr., formerly the dean of engineering at the University of Michigan. Munson, the Institute's tenth president, took office on July 1, 2017, replacing William W. Destler, who retired after 10 years at RIT. Ellen Granberg, formerly senior associate provost at Clemson University, was named provost in July 2018. She is the first female to serve as provost at RIT. The university's annual budget for 2010–2011 is $601 million, up from $571 million in the previous year. RIT's endowment fund is worth $544 million. The college has also been recognized in the Chronicle of Higher Education’s 2009 "Great Colleges to Work For Program" for a second year and is ranked among the top schools in six survey categories, including overall satisfaction with benefits, compensation and benefits, tuition reimbursement, 403(b) or 401(k) plans, disability insurance, and life insurance. The school is also a member of the Association of Independent Technological Universities. Inside view of the lounge area of the University Services Center, home to the Student Innovation Center, and the University's Finance department. RIT is known for its career focused education. The institute is chartered by the New York state legislature and accredited by the Middle States Association of Colleges and Schools. The university offers more than 200 academic programs, including seven doctoral programs across its nine constituent colleges. In 2008–2009, RIT awarded 2,483 bachelor's degrees, 912 master's degrees, 10 doctorates, and 523 other certificates and diplomas. The four-year, full-time undergraduate program constitutes the majority of enrollments at the university and emphasizes instruction in the "arts & sciences/professions." RIT is a member of the Rochester Area College consortium which allows students to register at other colleges in the Rochester metropolitan area without tuition charges. RIT's full-time undergraduate and graduate programs used to operate on an approximately 10-week quarter system with the primary three academic quarters beginning on Labor Day in early September and ending in late May. On August 2013, RIT transitioned from a quarter system to a semester system. The change was hotly debated on campus, with a majority of students opposed according to an informal survey; Student Government also voted against the change. Undergraduate tuition and fees for 2012–2013 totaled $45,602. RIT undergraduates receive over $200 million in financial assistance, and over 90% of students receive some form of financial aid. 3,210 students qualified for Pell Grants in 2007–2008. Among the eight colleges, 6.8% of the student body is enrolled in the E. Philip Saunders College of Business, 15.0% in the Kate Gleason College of Engineering, 4.3% in the College of Liberal Arts, 25.4% in the College of Applied Science and Technology, 18.0% in the B. Thomas Golisano College of Computing and Information Sciences, 13.9% in the College of Imaging Arts and Science, 5.7% in the National Technical Institute for the Deaf, and 9.2% in the College of Science. The five most commonly awarded degrees are in Business Administration, Engineering Technology, School of Photographic Arts & Sciences, School of Art and Design, and Information Technology. RIT has struggled with student retention, although the situation has improved during President Destler's tenure. 91.3% of freshmen in the fall of 2009 registered for fall 2010 classes, which Destler noted as a school record. RIT enrolled 13,711 undergraduate (9,190 male, 4,466 female, and 55 unknown) and 3,131 graduate students in fall 2015. There were 11,226 males and 5,537 females, resulting in a ratio of just over 2 (2.03) males per 1 female. Admissions are characterized as "more selective, higher transfer-in" by the Carnegie Foundation. RIT received 12,725 applications for undergraduate admission in Fall 2008, 60% were admitted, 34% enrolled, and 84% of students re-matriculated as second-year students. The interquartile range on the SAT was 1630–1910. 26% of students graduated after four years and 64% after six years. As of 2013, the 25th–75th percentile SAT scores are 540–650 Critical Reading, 570–680 Math, and 520–630 Writing—the average composite score being 1630–1960. A prospective student looks at a machine tools laboratory. Inside view of one of the campus's pottery studios. Bevier Gallery in Booth Hall. Interior view of the B. Thomas Golisano Hall, home of the College of Computing and Information Sciences, known as GCCIS. The Imaging science department was the first at the Institute to offer a doctoral program, in 1989, and remains the only formal program in Imaging Science in the nation (as a multidisciplinary field—separate constituent fields of physics, optics, and computer science are common in higher education). Associations exist between the department and Rochester-area imagery and optics companies such as Xerox, Kodak, and the ITT Corporation. Such connections have reinforced the research portfolio, expertise, and graduate reputation of the imaging researchers and staff of the department. As of 2008, imaging-related research has the largest budget at the Institute from grants and independent research. The Microelectronic Engineering program, created in 1982 and the only ABET-accredited undergraduate program in the country, was the nation's first Bachelor of Science program specializing in the fabrication of semiconductor devices and integrated circuits. The information technology program was the first nationally recognized IT degree, created in 1993. 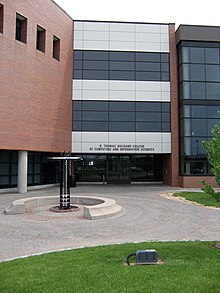 In 1996, Rochester Institute of Technology established the first software engineering Bachelor's degree program in the United States but did not obtain ABET accreditation until 2003, the same time as Clarkson University, Milwaukee School of Engineering and Mississippi State University. Starting in 2000, RIT began admitting students in the top of their application pools into the RIT Honors Program. Each college participates voluntarily in the program and defines their own program details. As an example, the College of Engineering focuses on engineering in a global economy, and uses much of the honors budget to pay for domestic and international trips for engineering students. In contrast, the College of Science is focused on expanding research, and provides most of its budget to student research endeavors. Students admitted to the program are given a small scholarship and have the opportunity to live in the honors residence hall. In 2011, the video game design program at RIT, one of two majors offered by School of Interactive Games and Media in the B. Thomas Golisano College of Computing and Information Sciences, was recognized by The Princeton Review as one of the top 10 programs in the country for video game design, with the undergraduate program ranking ninth, and the master's degree graduate program ranking fourth. The program as a whole has improved its standing in the Princeton Review ranking the following year, moving up to sixth for undergraduate and second for graduate in the rankings released March 1, 2012. In 2017, RIT was ranked #97 (tie) in National Universities category by US News and World Report. RIT's co-op program, which began in 1912, is the fourth-oldest in the world. It is also the fifth-largest in the nation, with approximately 3,500 students completing a co-op each year at over 2,000 businesses. The program requires (or allows, depending on major) students to work in the workplace for up to five quarters alternating with quarters of class. The amount of co-op varies by major, usually between 3 and 5 three-month "blocks" or academic quarters. Many employers prefer students to co-op for two consecutive blocks, referred to as a "double-block co-op". During a co-op, the student is not required to pay tuition to the school and is still considered a "full time" student. In addition, RIT was listed by U.S. News & World Report as one of only 12 colleges nationally recognized for excellence in the internships/co-ops category and has secured this ranking, which is based on nominations from college presidents, chief academic officers and deans, for four years in a row since U.S. News began the category in 2002. Additionally, according to the most recent PayScale College Salary Report, the median starting salary for a recent RIT graduate is $51,000 making it the highest among Rochester – area institutions. RIT Libraries house renowned special collections that enhance teaching, learning, and research in many of RIT's academic programs. The Cary Graphic Arts Collection contains books, manuscripts, printing type specimens, letterpress printing equipment, documents, and other artifacts related to the history of graphic communication. RIT Archives document more than 180 years of the institute's history, and students in the Museum Studies program frequently work with these artifacts and help create exhibitions. The RIT/NTID Deaf Studies Archive preserves and illustrates the history, art, culture, technology, and language of the Deaf community. The RIT Art Collection contains thousands of works showcasing RIT's visual arts curriculum. A look into the Semiconductor & Microsystems Fabrication Laboratory. Corporations have donated machines and tools for students to study and improve. RIT's research programs are rapidly expanding. The total value of research grants to Institute faculty for fiscal year 2007–2008 totaled $48.5 million, an increase of more than twenty-two percent over the grants from the previous year. The Institute currently offers eight Ph.D. programs: Imaging Science, Microsystems Engineering, Computing and Information Sciences, Color Science, Astrophysical Sciences and Technology, Sustainability, Engineering, and Mathematical Modeling. In 1986, RIT founded the Chester F. Carlson Center for Imaging Science, and started its first doctoral program in Imaging Science in 1989. The Imaging Science department also offers the only Bachelors (BS) and Masters (MS) degree programs in imaging science in the country. The Carlson Center features a diverse research portfolio; its major research areas include Digital Image Restoration, Remote Sensing, Magnetic Resonance Imaging, Printing Systems Research, Color Science, Nanoimaging, Imaging Detectors, Astronomical Imaging, Visual Perception, and Ultrasonic Imaging. The Center for Microelectronic and Computer Engineering was founded by RIT in 1986. The institute was the first university to offer a bachelor's degree in Microelectronic Engineering. The Center's facilities include 50,000 square feet (4,600 m²) of building space with 10,000 square feet (930 m²) of clean room space; the building will undergo an expansion later this year. Its research programs include nano-imaging, nano-lithography, nano-power, micro-optical devices, photonics subsystems integration, high-fidelity modeling and heterogeneous simulation, microelectronic manufacturing, microsystems integration, and micro-optical networks for computational applications. The Center for Advancing the Study of CyberInfrastructure (CASCI) is a multidisciplinary center housed in the College of Computing and Information Sciences. The Departments of Computer Science, Software Engineering, Information Technology, Computer Engineering, Imaging Science, and Bioinformatics collaborate in a variety of research programs at this center. RIT was the first university to launch a Bachelor's program in Information technology in 1991, the first university to launch a Bachelor's program in Software Engineering in 1996, and was also among the first universities to launch a Computer science Bachelor's program in 1972. RIT helped standardize the Forth programming language, and developed the CLAWS software package. The Center for Computational Relativity and Gravitation was founded in 2007. The CCRG comprises faculty and postdoctoral research associates working in the areas of general relativity, gravitational waves, and galactic dynamics. Computing facilities in the CCRG include gravitySimulator, a novel 32-node supercomputer that uses special-purpose hardware to achieve speeds of 4TFlops in gravitational N-body calculations, and newHorizons, a state-of-the art 85-node Linux cluster for numerical relativity simulations. The Center for Detectors was founded in 2010. The CfD designs, develops, and implements new advanced sensor technologies through collaboration with academic researchers, industry engineers, government scientists, and university/college students. The CfD operates four laboratories and has approximately a dozen funded projects to advance detectors in a broad array of applications, e.g. astrophysics, biomedical imaging, Earth system science, and inter-planetary travel. Center members span eight departments and four colleges. RIT has collaborated with many industry players in the field of research as well, including IBM, Xerox, Rochester's Democrat and Chronicle, Siemens, NASA, and the Defense Advanced Research Projects Agency (DARPA). In 2005, it was announced by Russell W. Bessette, Executive Director New York State Office of Science Technology & Academic Research (NYSTAR), that RIT will lead the University at Buffalo and Alfred University in an initiative to create key technologies in microsystems, photonics, nanomaterials, and remote sensing systems and to integrate next generation IT systems. In addition, the collaboratory is tasked with helping to facilitate economic development and tech transfer in New York State. More than 35 other notable organizations have joined the collaboratory, including Boeing, Eastman Kodak, IBM, Intel, International Sematech, ITT, Motorola, Xerox, and several Federal agencies, including as NASA. RIT has emerged as a national leader in manufacturing research. In 2017, the U.S. Department of Energy selected RIT to lead its Reducing Embodied-Energy and Decreasing Emissions (REMADE) Institute aimed at forging new clean energy measures through the Manufacturing USA initiative. RIT also participates in five other Manufacturing USA research institutes. RIT has 24 men's and women's varsity teams including Men's Intercollegiate Baseball, Basketball, Crew, Cross Country, Ice Hockey, Lacrosse, Soccer, Swimming & Diving, Tennis, Track & Field and Wrestling along with Women's Intercollegiate Basketball, Cheerleading, Crew, Cross Country, Ice Hockey, Lacrosse, Soccer, Softball, Swimming & Diving, Tennis, Track & Field, and Volleyball. RIT was a long-time member of the Empire 8, an NCAA Division III athletic conference, but moved to the Liberty League beginning with the 2011–2012 academic year. All of RIT's teams compete at the Division III level, with the exception of the men's and women's ice hockey programs, which play at the Division I level. In 2010, the men's ice hockey team was the first ever from the Atlantic Hockey conference to reach the NCAA tournament semi-finals: The Frozen Four. In 2011–2012, the RIT women's ice hockey team had a regular season record of 28–1–1, and won the NCAA Division III national championship, defeating the defending champion Norwich University 4–1. The women's team had carried a record of 54–3–3 over their past two regular seasons leading up to that point. The women's hockey team then moved from Division III to Division I. Starting in the 2012–2013 season, the women's team played in the College Hockey America conference. In 2014–2015, the team became eligible for NCAA Division I postseason play. Additionally, RIT has a wide variety of club, intramural, and pick-up sports and teams to provide a less-competitive recreational option to students. Since 1968 RIT's hockey teams played at Frank Ritter Memorial Ice Arena on campus. In 2010, RIT began raising money for a new arena. In 2011, B. Thomas Golisano and the Polisseni Foundation donated $4.5 million for the new arena, which came to be named the Gene Polisseni Center. The new 4,300 seat arena was completed in 2014 and the Men's and Women's teams moved into the new facility in September for the 2014–2015 season. RIT's athletics nickname is the "Tigers", a name given following the undefeated men's basketball season of 1955–56. Prior to that, RIT's athletic teams were called the "Techmen" and had blue and silver as the sports colors. In 1963, RIT purchased a rescued Bengal tiger which became the Institute's mascot, named SpiRIT. He was taken to sports events until 1964, when he was put down due to health complications. The original tiger's pelt now resides in the RIT Archive Collections at RIT Libraries. RIT helped the Seneca Park Zoo purchase a new tiger shortly after SpiRIT's death, but it was not used as a school mascot. A bronze sculpture by D.H.S. Wehle in the center of the Henrietta campus now provides an everlasting version of the mascot. RIT's team mascot is a version of this Bengal Tiger named RITchie. RITchie was the selected name entered in 1989 by alumnus Richard P. Mislan  during a College Activities Board "Name the RIT Tiger" contest. After it was announced that the RIT Men's Hockey Team was moving from Division III to Division I in 2005, RITchie was redesigned and made his debut in the fall of 2006. Global Village housing and student area. In addition to its academic and athletic endeavors, RIT has over 150 student clubs, 10 major student organizations, a diverse interfaith center and 30 different Greek organizations. Reporter magazine, founded in 1951, is the Institute's primary student-run magazine. RIT also has its own ambulance corps, bi-weekly television athletics program RIT SportsZone, pep band, radio station, and tech crew. The Institute's Gordon Field House and Activities Center is home to competitive and recreational athletics and aquatics, a fitness center, and an auditorium hosting frequent concerts and other entertainment. Its opening in late 2004 was inaugurated by concerts by performers including Kanye West and Bob Dylan. It is the second-largest venue in Monroe County. One of RIT's unique features is the large presence of deaf and hard-of-hearing students, who make up 8.8% of the student body. The National Technical Institute for the Deaf, one of RIT's nine colleges, provides interpreting and captioning services to students for classes and events. Many courses' lectures at RIT are interpreted into American Sign Language or captioned in real time for the benefit of hard-of-hearing and deaf students. There are several deaf and hard-of-hearing professors and lecturers, too; an interpreter can vocalize their lectures for hearing students. This significant portion of the RIT population provides another dynamic to the school's diversity, and it has contributed to Rochester's high number of deaf residents per-capita. In 2006, Lizzie Sorkin made RIT history when she became the first deaf RIT Student Government President. In 2010, Greg Pollock became the second deaf RIT Student Government President. In 2018, Robert "Bobby" Moakley became the third deaf RIT Student Government President. Explore Your Future (EYF) is a six-day career exploration program at Rochester Institute of Technology for college-bound deaf and hard-of-hearing high school students who will begin their junior or senior year. RIT's campus is host to thirty fraternities and sororities (eighteen fraternities and twelve sororities), which makes up 6.5% of the total RIT population. RIT built six large buildings for Greek students on the academic side of campus next to the Riverknoll apartments. In addition to these six houses, there is also limited space within the residence halls for another six chapters. The Interfraternity Council (IFC) provides outlets for social interaction among the fraternity and sorority members. The IFC helps to sponsor educational opportunities for all of its members and to help to promote the fraternal ideals of leadership, scholarship, service, community and brotherhood. There are currently eleven chapters that are part of the IFC at RIT. The Panhellenic Council is the governing body of the sorority system. The Panhellenic Council provides many opportunities for involvement in campus life and the fraternity and sorority system outside of the individual sororities. Recruitment, social, and educational opportunities are provided by the council. All five social sororities recognized by Rochester Institute of Technology are active members of the National Panhellenic Conference. RIT's dormitories are home to seven "Special Interest Houses" — Art House, Computer Science House, Engineering House, House of General Science, International House, Photo House, and Unity House — which provide an environment to live immersed in a specific interest, such as art, engineering, or computing. Members of a special-interest house share their interests with each other and the rest of campus through academic focus and special activities. Special Interest Houses are self-governing and accept members based on their own criteria. In the early 2000s, RIT had a Special Interest House called Business Leaders for Tomorrow, but it no longer exists. RIT is the host of the Air Force ROTC Detachment 538 "Blue Tigers" and the Army ROTC "Tiger Battalion". RIT students may also enroll in the Naval ROTC program based at the University of Rochester. In 2009, the "Tiger Battalion" was awarded the Eastern Region's Outstanding ROTC Unit Award, given annually by the Order of the Founders and Patriots of America. In 2010, it was awarded the National MacArthur Award for 2nd Brigade. Reporter Magazine (Reporter) is a completely student run organization through the Rochester Institute of Technology. The magazine is a 32-page full-color issue printed on the first Friday of the month for the duration of the academic year supplemented with daily online content. Reporter provides insightful content pertinent to the RIT community and the Rochester community at large. Students at RIT can immerse themselves with learning about radio theory and communications by joining RIT's own amateur radio club K2GXT. It is the oldest club on campus and was founded in 1952. An FM radio station run by students at RIT, WITR 89.7 broadcasts various music genres, RIT athletic events, and several talk radio programs. WITR can be heard throughout Rochester and its suburbs, and via an online stream on its website. The radio station recently opened up a studio in the SAU with a see-thru window in 2015. The College Activities Board, frequently abbreviated as CAB, is a student-run organization responsible for providing "diverse entertainment and activities to enhance student life on the RIT campus." CAB is responsible for annual concerts, class trips, movie screenings, and other frequent events. An annual festival, publicized as "Imagine RIT", was initiated in May 2008 to showcase innovative and creative activity at RIT. It is one of the most prominent changes brought to RIT by former university president, William Destler. An open event, visitors to Imagine RIT have an opportunity to tour the RIT campus and view new ideas for products and services, admire fine art, explore faculty and student research, examine engineering design projects, and interact with hundreds of hands-on exhibits. Theatrical and musical performances take place at stages in many locations on the RIT campus. Intended to appeal to visitors of all ages, including children, the festival features a variety of exhibits. More than 17,000 people attended the inaugural festival on May 3, 2008 and over 25,000 people attended the second annual event. RIT Ambulance (RITA) is a community run, 9-1-1 dispatched collegiate New York State Certified Basic Life Support Ambulance Corps, run under the governance of the Student Health Center. The ambulance serves the entire Rochester Institute of Technology campus and portions of surrounding Henrietta, New York and is also a part of the Monroe County mutual aid plan. RIT Ambulance provides coverage 24 hours a day, 7 days a week throughout the year. The ambulance is staffed on a volunteer basis by students, faculty, staff, and alumni. In the event of a serious injury or illness that requires interventions beyond the scope of Basic Life Support, a Paramedic "fly car" unit is dispatched and will meet the ambulance on scene or during early stages of transport. Due to the fact that RIT Ambulance is dispatched by the Monroe County 911 dispatcher, Public Safety must call 911 for any medical emergencies that occur on campus. RIT Public Safety is the primary agency responsible for protection of students, staff and property as well as enforcement of both college policies and state laws. Officers are NYS Licensed Security Guards who possess an expanded scope of authority under NYS Education Law, and many Officers have prior law enforcement backgrounds. In 2016, it was announced that RIT Public Safety will deploy officers armed with long guns to respond to active shooter incidents. Public Safety Officers operate both a dispatch center and various types of patrol units on campus and at off campus holdings (such as The Inn and Conference Center) and also manage the Call Box System. Activating a call box will automatically place the user in touch with an Officer in the dispatch center who will direct Patrol Officers to respond to the location; if necessary, Officers will summon the Monroe County Sheriff's to respond as well. As the college does not have 24/7 on campus crisis intervention counselors, in the event of a mental or behavioral health incident during hours where a counselor is not available, Public Safety Officers are also trained to act as mediators until an on-call counselor can be summoned. RIT Dining Services manages a large number of restaurants and food shops, along with the sole dining hall on campus. There are locations throughout RIT, including near the Residence Halls, in the Student Alumni Union, Global Village, and in certain academic buildings. RIT is governed under a shared governance model. The shared governance system is composed of the Student Government, the Staff Council, and the Academic Senate. The Institute Council brings together representatives from all three groups and makes recommendations to the President of the Institute. Once the Institute Council has made a recommendation, the President makes the final decision. The Student Government consists of an elected student senate and a cabinet appointed by the President and Vice President. Elections for academic and community senators occur each spring, along with the elections for the President and Vice President. The cabinet is appointed by the President and Vice President. The Student Government is an advocate for students and is responsible for basic representation as well as improving campus for students. The Student Government endorses proposal that are brought before the Institute Council. The Academic Senate is responsible for representing faculty within the shared governance system. The Academic Senate has 43 senators. The Staff Council represents staff in the shared governance system. Katherine Hayles received a B.S from RIT in 1966. RIT has over 125,000 alumni worldwide. Notable alumni include Bob Duffy, former New York Lieutenant Governor; Tom Curley, former President and CEO of the Associated Press; Daniel Carp, former Chairman of the Eastman Kodak Company; John Resig, software developer and creator of jQuery; N. Katherine Hayles, critical theorist; Austin McChord, founder and CEO of Datto; Jack Van Antwerp, former Director of Photography for The Wall Street Journal; and photojournalist Bernie Boston. In the decades prior to the selection of RIT's first president, the institute was administered primarily by the Board of Trustees. In addition to the ten official presidents, Thomas R. Plough served as acting president twice: once, in February 1991 when M. Richard Rose was on sabbatical with the CIA, and again in 1992 between Rose's retirement and Albert J. Simone's installation. ^ "Rochester Institute of Technology Consolidated Financial Statements June 30, 2018 and 2017" (PDF). 2018. Retrieved January 10, 2019. ^ a b c d e "RIT In Brief". 2018. Retrieved January 10, 2019. ^ "Brand Portal". RIT. Retrieved November 11, 2018. ^ "RIT – Prospectus" (PDF). Rochester Institute of Technology. Archived from the original (PDF) on April 11, 2008. Retrieved April 3, 2008. ^ "RIT – RIT Archives – Spirit of RIT". Rochester Institute of Technology. Retrieved April 3, 2008. ^ "RIT press release on US News rankings". ^ "US News – Best Graduate Programs". Retrieved July 12, 2008. ^ "RIT press release on Design Intelligence rankings". ^ Gordon, Dane R. (2007). Rochester Institute of Technology: Industrial Development and Educational Innovation in an American City, 1829–2006. RIT Cary Graphic Arts Press. ISBN 978-1-933360-23-2. ^ Rochester Institute of Technology. "RIT Timeline". Archived from the original on February 26, 2008. Retrieved December 26, 2007. ^ "ROCHESTER TO GET U.S. DEAF COLLEGE". The New York Times. November 15, 1966. p. 22. ^ Marschark, Marc; Lang, Harry G. (2002). Educating Deaf Students: From Research to Practice. New York, New York: Oxford University Press. p. 35. ISBN 978-0-19-512139-1. OCLC 45668968. ^ a b c "History of RIT". Retrieved February 14, 2009. ^ "Programs of Study". Rochester Institute of Technology. Retrieved December 10, 2014. ^ "Software Engineering @ RIT". Department of Software Engineering. RIT. Retrieved September 6, 2010. ^ Rochester Institute of Technology. "Ask President Destler". Archived from the original on November 7, 2007. Retrieved December 26, 2007. ^ "RIT Named Campus Sustainability Leader". Rit.edu. October 8, 2009. Retrieved July 24, 2010. ^ "The Quarter Mile". Rit.edu. Retrieved December 5, 2014. ^ Democrat & Chronicle. "Park Point housing complex at RIT progresses". Retrieved December 26, 2007. ^ a b "RIT Art Collection | RIT Archive Collections". library.rit.edu. Retrieved 2017-07-13. ^ "The Sentinel - RIT: Art on Campus". artoncampus.rit.edu. Retrieved 2017-07-13. ^ "Growth and Youth - RIT: Art on Campus". artoncampus.rit.edu. Retrieved 2017-07-13. ^ "Principia - RIT: Art on Campus". artoncampus.rit.edu. Retrieved 2017-07-13. ^ "Principia: A Guide to the Atrium Floor" (PDF). Rochester Institute of Technology. Retrieved July 13, 2017. ^ "Three Piece Reclining Figure No. 1 - RIT: Art on Campus". artoncampus.rit.edu. Retrieved 2017-07-13. ^ "Sundial - RIT: Art on Campus". artoncampus.rit.edu. Retrieved 2017-07-13. ^ "The Monument to Ephemeral Facts - RIT: Art on Campus". artoncampus.rit.edu. Retrieved 2017-07-13. ^ "Unity - RIT: Art on Campus". artoncampus.rit.edu. Retrieved 2018-01-30. ^ "Introducing President Munson". RIT.edu. Retrieved October 1, 2017. ^ "The Year in Review: RIT by the numbers" (PDF). Rochester Institute of Technology. Retrieved August 21, 2010. ^ As of June 30, 2009. "U.S. and Canadian Institutions Listed by Fiscal Year 2009 Endowment Market Value and Percentage Change in Endowment Market Value from FY 2008 to FY 2009" (PDF). 2009 NACUBO-Commonfund Study of Endowments. National Association of College and University Business Officers. Archived from the original (PDF) on December 14, 2017. Retrieved March 15, 2010. ^ "RIT Honored as a 'Best College to Work For' on The Chronicle of Higher Education List for 2009". Rit.edu. July 6, 2009. Retrieved July 24, 2010. ^ Bob Finnerty (December 5, 2007). "RIT to Open Dubai Campus in Fall 2008". ^ "RIT – International Students". Rit.edu. Retrieved August 17, 2013. ^ a b c "Carnegie Classifications". The Carnegie Foundation for the Advancement of Teaching. Retrieved December 4, 2009. ^ "History, Accreditation, Legacy". Rochester Institute of Technology. Archived from the original on January 6, 2010. Retrieved December 4, 2009. ^ "Statement of Accreditation Status – Rochester Institute of Technology". Middle States Commission on Higher Education. Archived from the original on November 13, 2009. Retrieved December 9, 2009. ^ "Colleges". Rochester Institute of Technology. Archived from the original on May 27, 2010. Retrieved December 4, 2009. ^ a b c "Registration Guide 2009–2010" (PDF). Archived from the original (PDF) on July 20, 2011. Retrieved December 4, 2009. ^ "Fast Facts". Rochester Institute of Technology. Retrieved December 4, 2009. ^ "Message from President Destler Concerning Change in RIT's Academic Calendar". Rochester Institute of Technology. Retrieved February 10, 2010. ^ "HugeDomains.com - ReporterMag.com is for sale (Reporter Mag)". reportermag.com. ^ "Undergraduate Cost of Attendance Estimate". Rochester Institute of Technology. Retrieved November 26, 2012. ^ "Financial Aid & Scholarships" (PDF). Rochester Institute of Technology. Retrieved December 4, 2009. ^ a b "College Navigator – Rochester Institute of Technology". National Center for Education Statistics, U.S. Department of Education. ^ a b "RIT In Brief". Rochester Institute of Technology. Retrieved March 4, 2014. ^ "Degree Certifications by College and Department, 2008–2009" (PDF). Institutional Research and Policy Studies, Rochester Institute of Technology. Retrieved December 4, 2009. ^ Destler, Bill. "President Destler's 2010–2011 Welcome Back Address". RIT University News. Archived from the original on August 31, 2010. Retrieved August 31, 2010. ^ "Fall Enrollment by Race/Ethnicity (All)" (PDF). Institutional Research and Policy Studies, Rochester Institute of Technology. Retrieved March 4, 2014. ^ Rochester Institute of Technology. "RIT Research Programs 2008 Annual Report" (PDF). Archived from the original (PDF) on December 19, 2008. Retrieved December 1, 2008. ^ "Rochester Institute of Technology". Mentornet.net. Retrieved July 24, 2010. ^ "25 Years of Microelectronic Engineering Education", Santosh K. Kurinec, et al., 16th Biennial University Government Industry Microelectronics Symposium Proceedings, San Jose State University, San Jose, CA, June 2006. ^ American College of Management and Technology. "RIT Overview". Retrieved December 26, 2007. ^ "RIT Honors Overview". Archived from the original on February 29, 2008. Retrieved January 21, 2008. ^ "Princeton Review Ranks Top Video Game Design Schools". GameSpy. Archived from the original on December 7, 2011. Retrieved March 30, 2012. ^ "Top Video Game Design Press Release". The Princeton Review. Retrieved March 30, 2012. ^ "RIT now among the top 100 universities in the nation". www.rit.edu. September 12, 2017. Retrieved November 3, 2017. ^ Middle States Self-study report Archived September 26, 2007, at the Wayback Machine, March 21–23, 2007. ^ Flanigan, Robin L. (July 2007). "Beyond the Cap and Gown". US Airways Magazine. pp. 172–176. Archived from the original on July 5, 2007. Retrieved July 3, 2007. ^ "RIT Graduates Rank High in Annual Salary Study". Rit.edu. July 27, 2009. Retrieved July 24, 2010. ^ Test area of Center for Advanced Defense Studies. "Rochester Institute of Technology | Center for Advanced Defense Studies". C4ads.org. Archived from the original on July 13, 2010. Retrieved July 24, 2010. ^ "About the Cary Collection | Cary Graphic Arts Collection". library.rit.edu. Retrieved 2017-07-13. ^ "RIT Archives | RIT Archive Collections". library.rit.edu. Retrieved 2017-07-13. ^ "RIT/NTID Deaf Studies Archive | RIT Archive Collections". library.rit.edu. Retrieved 2017-07-13. ^ Rochester Institute of Technology. "RIT Records Another Record Year for Sponsored Research Funding". Retrieved October 3, 2008. ^ Rochester Institute of Technology Offices of Part-time and Graduate Enrollment Services. "RIT — Programs of Study — Doctor of Philosophy in Imaging Science". Retrieved April 2, 2011. ^ Rochester Institute of Technology Offices of Part-time and Graduate Enrollment Services. "RIT — Programs of Study — Doctor of Philosophy in Microsystems Engineering". Retrieved April 2, 2011. ^ Rochester Institute of Technology Offices of Part-time and Graduate Enrollment Services. "RIT — Programs of Study — Doctor of Philosophy in Computing and Information Sciences". Retrieved April 2, 2011. ^ Rochester Institute of Technology Offices of Part-time and Graduate Enrollment Services. "RIT — Programs of Study — Doctor of Philosophy in Color Science". Retrieved April 2, 2011. ^ Rochester Institute of Technology Offices of Part-time and Graduate Enrollment Services. "RIT — Programs of Study — Doctor of Philosophy in Astrophysical Sciences and Technology". Retrieved April 2, 2011. ^ Rochester Institute of Technology Offices of Part-time and Graduate Enrollment Services. "RIT — Programs of Study — Doctor of Philosophy in Sustainability". Retrieved April 2, 2011. ^ "RIT – Offices of Graduate & Part-time Enrollment Services". www.rit.edu. Retrieved January 13, 2017. ^ "Center for Detectors Web Site". ^ "New center at RIT finds novel ways to use photo sensors". Archived from the original on April 3, 2012. Retrieved November 8, 2011. ^ "RIT collaborates with IBM on genomic research". scienceblog.com. January 2003. Retrieved September 27, 2010. ^ "Xerox Commits $2 Million to RIT Targeting Education and Research in Sustainability". Green At Work. April 25, 2008. Retrieved July 24, 2010. ^ "D&C joins RIT in printing industry research" (PDF). RIT. Retrieved September 27, 2010. ^ "Siemens and RIT announce research partnership". Controlglobal.com. Retrieved July 24, 2010. ^ "NASA Awards Grant to RIT to Develop New Polymer Foam Packaging for Lunar Missions". Rit.edu. January 9, 2009. Retrieved July 24, 2010. ^ "RIT Effort Could Extend NASA Science Capabilities for Planetary Applications". Azooptics.com. May 16, 2008. Retrieved July 24, 2010. ^ "Microsystems Technology Office-Wide Broad Agency Announcement DARPA-BAA-09-25". FedBizOpps.gov. April 14, 2010. Retrieved March 14, 2011. ^ "Speeches – Partnerships and Collaborations: A New Research Paradigm". Nystar.state.ny.us. May 4, 2005. Archived from the original on July 23, 2011. Retrieved July 24, 2010. ^ "RIT named by U.S. Dept. of Energy to lead new Manufacturing USA Institute on clean energy". www.rit.edu. Retrieved January 12, 2017. ^ "RIT named national leader in Manufacturing USA federal initiative". www.rit.edu. Retrieved January 12, 2017. ^ "RIT – RIT downs UNH, reaches Frozen Four". .espn.com. 2010-03-28. Retrieved March 28, 2010. ^ "RIT Women's Hockey wins NCAA Division III National Title". RIT Athletics. Retrieved March 30, 2012. ^ "RIT Women's Hockey Making Move To Division I". RIT Athletics. Retrieved March 30, 2012. ^ "Sept. 25 -- RIT football opens 2nd season under Tom Coughlin". Rochester Democrat and Chronicle. Retrieved 2019-02-18. ^ "RIT Power Play Campaign". Rochester Institute of Technology. Retrieved March 30, 2012. ^ "Future RIT Hockey Arena to Become the Gene Polisseni Center". ^ "RIT – 175 Year Anniversary". .rit.edu. Archived from the original on June 20, 2010. Retrieved July 24, 2010. ^ "Highlights | RIT Archive Collections". library.rit.edu. Retrieved 2017-06-26. ^ "RIT Bengal Tiger - RIT: Art on Campus". artoncampus.rit.edu. Retrieved 2017-06-26. ^ "Mislan Awards". .mislan.com. Archived from the original on April 11, 2013. Retrieved August 4, 2012. ^ a b Rochester Institute of Technology. "RIT – Center for Campus Life". Archived from the original on August 22, 2007. Retrieved January 21, 2008. ^ RIT Digital Media Repository — Reporter Magazine (December 17, 2010). "Reporter Magazine". Retrieved February 19, 2011. ^ "RIT Brick City Ambassadors — The Reporter: Past & Present". October 12, 2010. Retrieved February 19, 2011. ^ Silandara Bartlett (November 4, 2004). "Bob Dylan at RIT Nov. 13". Archived from the original on February 26, 2008. Retrieved January 21, 2008. ^ Silandara Bartlett (September 29, 2004). "Brick City Festival Brings Kanye West and David Spade to RIT". Retrieved January 21, 2008. ^ "Real Estate News". BTRCA. Archived from the original on June 2, 2013. Retrieved August 17, 2013. ^ Rochester Institute of Technology. "Cluster: Diversity/Deaf Culture and Language". Retrieved January 21, 2008. ^ Adam Stone (April 28, 2006). "First Deaf RIT Student Government President". Archived from the original on October 30, 2006. Retrieved January 21, 2008. ^ a b Rochester Institute of Technology. "Fast Facts". Retrieved January 21, 2008. ^ "RIT INTERFRATERNITY COUNCIL". Archived from the original on December 30, 2011. Retrieved December 16, 2011. ^ "RIT COLLEGE PANHELLENIC ASSOCIATION". Retrieved December 16, 2011. ^ Rochester Institute of Technology. "Special Interest & Lifestyle Floors | Housing Operations". Retrieved March 5, 2017. ^ Rochester Institute of Technology. "RIT – Housing Operations : Special Interest Houses". Archived from the original on March 5, 2008. Retrieved January 21, 2008. ^ "Air Force ROTC Detachment 538". January 26, 2011. Retrieved February 19, 2011. ^ "RIT Army ROTC". Retrieved February 19, 2011. ^ "RIT Army ROTC Battalion Selected for Outstanding ROTC Unit Award". February 3, 2010. Retrieved September 29, 2010. ^ "Top Army ROTC units receive MacArthur Award". February 3, 2010. Archived from the original on July 22, 2011. Retrieved September 29, 2010. ^ "K2GXT - RIT's Amateur Radio Club". www.rit.edu. Retrieved 2019-01-20. ^ "WITR 89.7". Rochester Institute of Technology. Retrieved March 12, 2014. ^ "RIT College Activities Board – About". Rochester Institute of Technology. Retrieved March 12, 2014. ^ a b "Imagine RIT: Innovation and Creativity Festival". Rochester Institute of Technology. Retrieved February 19, 2010. ^ Guerrein, Jordan (November 30, 2016). "Public Safety Officers at RIT will soon be armed". ^ "RIT – Counseling Center – FAQs". rit.edu. ^ "RIT Dining Services Locations". Retrieved March 4, 2014. ^ "About the Council". Archived from the original on July 14, 2015. Retrieved July 7, 2015. ^ "RIT Student Government". Retrieved July 7, 2015. ^ "RIT – Academic Senate". Retrieved July 7, 2015. ^ "RIT Staff Council – It is Staff Council's vision to be the respected collective voice of Staff within RIT's shared governance process". Retrieved July 7, 2015. ^ "John Resig - Research". ejohn.org. ^ "RIT to Hunt President To Succeed Ellingson". Democrat and Chronicle. Rochester, New York. December 12, 1968. p. 1B. ^ a b "N. Carolina Educator New RIT President". Democrat and Chronicle. Rochester, New York. June 26, 1969. p. 1B. ^ "Kellogg Foundation appoints 2 part-time program consultants". Battle Creek Enquirer. Battle Creek, Michigan. November 29, 1978. p. B-7. ^ "New RIT head was tough-minded at Alfred U". Democrat and Chronicle. Rochester, New York. September 19, 1978. p. 1B. ^ "RIT chief cites CIA ties in his decision to retire". Democrat and Chronicle. Rochester, New York. September 4, 1991. p. 1A. ^ "Simone picked RIT to have 'fun'". Honolulu Star-Bulletin. Honolulu, Hawaii. May 19, 1992. p. A-3. ^ "Replacing Simone a tall order". Democrat and Chronicle. Rochester, New York. May 18, 2006. p. 3B. ^ "New leader wants RIT, its students to innovate". Democrat and Chronicle. Rochester, New York. March 17, 2007. p. 3B. ^ "RIT's Destler to retire in 2017". Democrat and Chronicle. Rochester, New York. May 10, 2016. p. 1A. ^ "Munson promising a broad vision for RIT". Democrat and Chronicle. Rochester, New York. January 26, 2017. p. 1A. ^ "New job challenge to an RIT official". Democrat and Chronicle. Rochester, New York. June 14, 1980. p. 5B. ^ "RIT appoints Thomas Plough to new position as provost". Democrat and Chronicle. Rochester, New York. May 28, 1984. p. 3B. ^ a b "A leadership shuffle at RIT". Democrat and Chronicle. Rochester, New York. August 3, 1994. p. 1B. ^ a b "RIT professor named provost". Democrat and Chronicle. Rochester, New York. November 8, 1995. p. 2B. ^ "Provost heartens RIT grads". Democrat and Chronicle. Rochester, New York. May 24, 2008. p. 1B. ^ "RIT hires a senior academic affairs VP". Democrat and Chronicle. Rochester, New York. March 11, 2008. p. 1B. ^ "First female provost to start at RIT in August". Rochester Business Journal. Rochester, New York. July 13, 2018. Retrieved September 7, 2018. ^ "A leadership shuffle at RIT". Democrat and Chronicle. Rochester, New York. August 3, 1994. p. 1B. He had served as acting president of RIT twice—first, when former President M. Richard Rose took a sabbatical to work for the CIA in 1991, and again when Rose retired in 1992. ^ "RIT picks its next president". Democrat and Chronicle. Rochester, New York. May 19, 1992. p. 1A. Austin, Bruce A. (2018). Imagine This! : RIT's Innovation + Creativity Festival. Rochester, N.Y.: RIT Press. ISBN 9781939125484. Gordon, Dane R. (2007). Rochester Institute of Technology: Industrial Development and Educational Innovation in an American City, 1829–2006. Rochester, N.Y.: RIT Press. ISBN 9781933360232. McCarthy, James K. (2018). A Shining Beacon: Fifty Years of the National Technical Institute for the Deaf. Rochester, N.Y.: RIT Press. ISBN 9781939125491. Simmons, Becky (2018). Transforming the Landscape: Fifty years on the New RIT Campus. Rochester, N.Y.: RIT Press. ISBN 9781939125576. Wikimedia Commons has media related to Rochester Institute of Technology.